Apply to our Graduate Program! Digital American Studies offers new ways of exploring the influences and resonances of digital technology among American peoples, cultures, memories, histories, art, and how we think about and engage with them. Faculty, graduate students, and undergraduate students working in Digital American Studies teach and learn about digital methods for working with vast bodies of source material; for close study of manuscripts, literature, and art; and for creative, provocative, and public-facing presentation of our research. Digital American Studies benefits from the presence of the Digital Innovation Lab and activities of the Carolina Digital Humanities Initiative. The CDHI offers a Graduate Certificate in Digital Humanities. The Digital Innovation Lab (DIL) is a project-focused hub for collaborative, interdisciplinary discovery, experimentation, implementation, and assessment in the use of digital technologies to advance the work of the University in the humanities and humanistic social sciences. The DIL was launched by the College of Arts and Sciences in 2011 and is administratively housed in the Department of American Studies. The DIL website contains additional information on projects and tools developed through the lab and current activities. 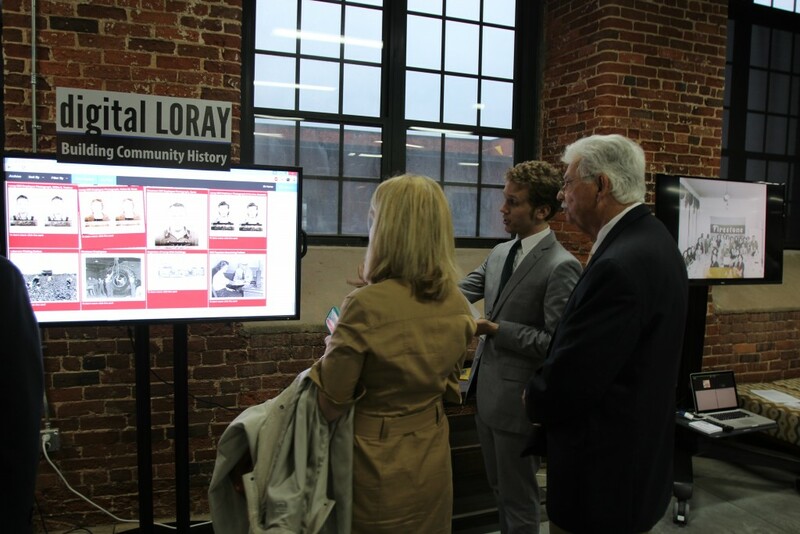 Elijah Gaddis demonstrates the digital archive, a part of Digital Loray. The DIL undertakes all its work through interdisciplinary collaboration, involving scholars and students from a wide range of disciplinary orientations, technology experts, and digital humanities facilitators and project managers who bridge these domains. The Digital Innovation Lab has supported the development of several undergraduate courses in American Studies that explore the use of digital technologies in teaching and learning. Students make use of digitized primary source material in their research, develop new ways of learning from academic monographs, and hone digital writing and publication skills. They have also contributed directly to public digital humanities projects undertaken by the lab in collaboration with cultural heritage organizations. The DIL engages undergraduate students as lab assistants during the academic year and in the summer to participate in the ongoing work of the DIL and as members of project teams. Interested students (regardless of discipline) should contact the DIL Lab Manager, Will Bosley. The graduate program in American Studies offers collaborative and interdisciplinary opportunities in the digital humanities at the intersection of computing and humanities, embracing a variety of topics ranging from curating online collections and exhibitions to mining information from large data sets. Graduate courses in digital humanities are offered through the American Studies department in conjunction with the Digital Innovation Lab (DIL). The Digital Humanities Practicum (AMST 850) combines practical work on public-facing digital humanities projects with seminar-style discussions of the theoretical implications of such work. It will be offered next in the fall term of 2015. Interested students should contact Professor Robert Allen, Director of the DIL. AMST 840 (Digital Humanities/Digital American Studies) also provides an opportunity for graduate students to apply the methods and materials of the digital humanities to topics in American Studies. Both courses count toward the Graduate Certificate in Digital Humanities. Graduate students may also apply for CDHI Graduate Fellows Program, which will add a summer stipend to a Ph.D. student’s departmental award and an opportunity to explore the use of digital technologies in humanistic inquiry through participation in DIL projects. The DIL regularly involves graduate and undergraduate students as research assistants on digital projects. Interested students should contact Will Bosley, DIL General Manager.